Devon, England on the United Kingdom's southern coast is varied and beautiful with both rocky coast and beaches. 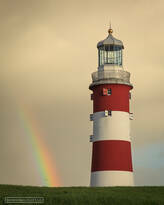 Large coastal towns like Plymouth also have their own beauty with its prominent lighthouse, and historical areas such as the Barbican. In central Devon lies the beautiful and desolate Dartmoor with grassland and interesting shaped rock formations called "tors".